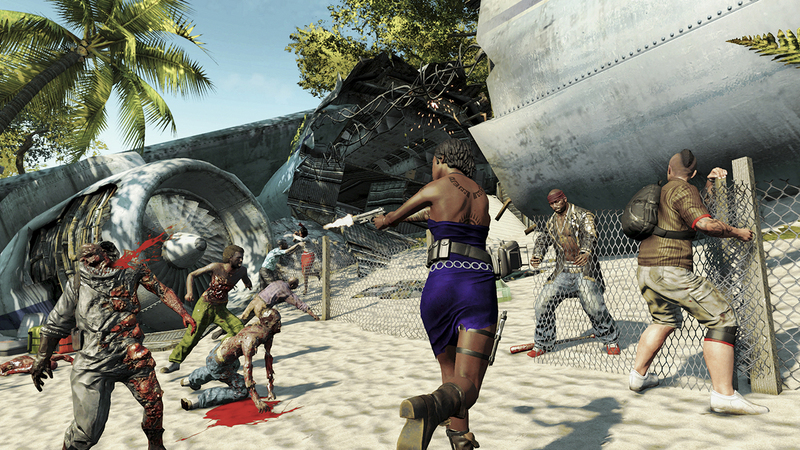 Around 19 months ago was the release of the first ever Dead Island game, and it was released with very mixed reviews. I personally enjoyed the first game but it needed some big changes for it too be considered a “great” game, sadly nothing much has really changed from the first Dead Island to Riptide but also has some parts where the game really shines. Let’s see what Dead Island: Riptide got right and mostly wrong. The opening video to Riptide was perfect, it gets the player up to speed with what was going on during the first game and shows briefly what happened straight after the original game ended. After the surprisingly good opening we meet the 5th character who is new to Dead Island named John Morgan. John’s introduction was kept pretty simple, when the original team of four get locked up they meet John, and it’s pretty much “Hey I’m immune to the infection too” “Join us then!” after the rushed introduction and some minor storyline happenings, we finally get into the gameplay. Not so long after you will find yourself back on another island called Palanoi. Pretty much straight after arriving on the island you will make your way towards an area full of survivors which leads to one of the few new additions to Riptide’s gameplay as zombies can now attack in hordes, and there will be a icon on the screen showing the hordes strength as each zombie you kill the meter goes lower and lower until every zombie is killed. Before the hordes arrival you was asked by another survivor to put up fences to protect the survivors from the zombies, the zombies will attack and eventually destroy your fences. 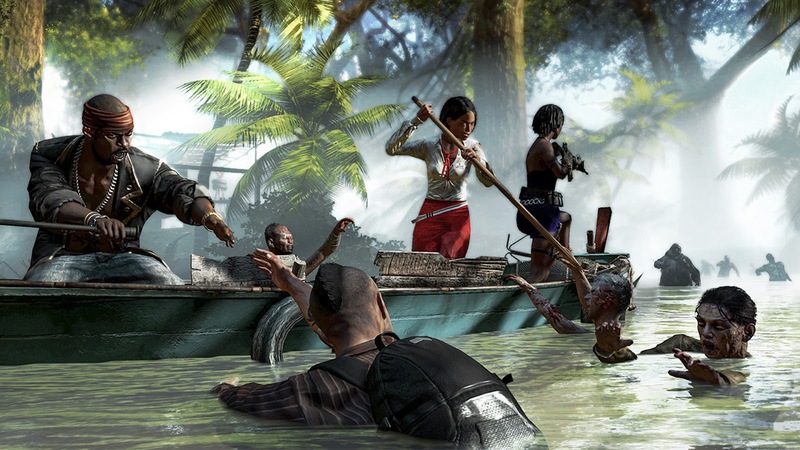 I actually really liked this addition to Dead Island and thought the same about the addition of boats. After this strong start I thought “Hey? Maybe this game might be pretty good” but not long after thinking that, it goes downhill quick. 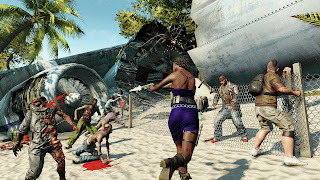 Dead Island Riptide has way too many different features carried over from the original Dead Island, I noticed how during combat the characters would still say lines from the original game, Zombies make the same noise when attacked, Same animations for certain things like kicking enemies and breaking the cracked cars window and other things show how much this game has been rushed. After almost 20 hours of gameplay, I honestly can’t find much different from the original to Riptide except hordes, boats, a new character and enemies, even though the setting might be different it is still pretty much the same as the original games setting. Somehow even existing problems from Dead Island made its way back to Riptide like the terrible respawn system that sometimes respawned me in some of the most stupidest places like right in front of multiple enemies causing almost instant death or being respawned even further from the mission. One of Riptide’s major problems is how similar each mission is to the other, almost every mission in the game is a fetch quest that can also turn into another fetch quest on top of the original fetch quest, and this happens straight after the fun horde mission when you have to fetch a boat motor to get to another part of the island. The problem is fetch quests get extremely dull and repetitive fast, and when like 90% of the game is fetch quests the other 10% of the game suffers from this big 90% of dullness dragging down what could be a great open world zombie survival game. If a true sequel comes out for Dead Island (Somehow this is a “spinoff” even though it follows the main story) then changes are needed to the quest system, fetch quests need to be cut down to a much more forgiving amount, and in its place should be unique quests that we haven’t seen in Dead Island before. Dead Island: Riptide is a rushed, mediocre game that could have been so much better, the first 30-45 minutes actually had legitimate promise (Minus the laughable introduction of John) I really liked the horde of zombies that attacked our group of survivors at the start and also how we had to fortify the area to keep the zombies at bay, almost straight after though the major problems start to arise like how repetitive the game is and how annoying the characters become. There is still something about this series that makes me think it could be really good if the problems are fixed, it’s just a matter of whether they will be fixed in the next game or not.